Petticoat Lane Market was established over 400 years ago by the French Huguenots who sold petticoats and lace from the stalls. The prudish Victorians changed the name of the Lane and market to avoid referring to woman's underclothes. Although the street was renamed Middlesex Street in the early 1800s it is still known as Petticoat Lane Market today. From Monday to Friday Petticoat Lane Market is located on Wentworth Street but on Sundays, it spreads out much further. The market is well-known for its leather goods, plus you'll also find chain store clothes at bargain prices, watches, junk jewelry, and toys. Petticoat Lane Market has been held in the area since at least the 1750s and now features more than 1,000 market stalls on Sundays. Leather jackets are the specialty at the top end of the market (near Aldgate East) and the rest of the market is full of bargain clothing. Market traders buy bulk end-of-season lines and sell them on at great reductions. Women's fashion is always popular here. As well as clothing, you can also find a good range of toys and electronic goods such as stereos, radios, DVD players, and videos, plus shoes and bric-a-brac. The market is held in and around Middlesex Street on Sundays from 9 am to 2:30 pm, with a smaller market, open on Wentworth Street from Monday to Friday. Old Spitalfields Market—A seriously cool place to shop. The market is surrounded by independent shops selling hand-made crafts, fashion, and gifts. The market is busiest on Sundays but opens Monday to Friday too. Shops open 7 days a week. 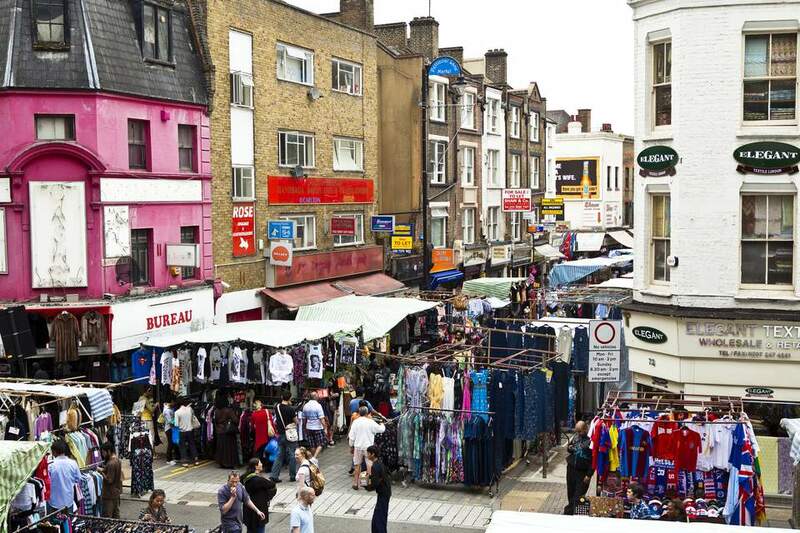 Brick Lane Market—Traditional Sunday morning flea market with a wide array of goods on sale including vintage clothes, furniture, bric-a-brac, music, and so much more. Columbia Road Flower Market—Every Sunday between 8 am and 2 pm, along this narrow cobbled street, you can find over 50 market stalls and 30 shops selling flowers, and gardening supplies. It's a truly colorful experience.